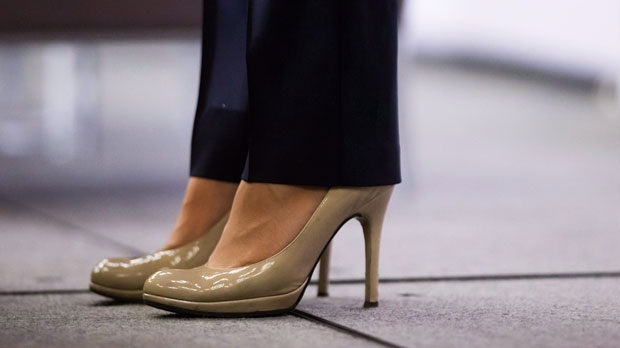 TORONTO -- Women in Ontario would be protected from being required to wear high heels at work under a bill being introduced Tuesday. The private member's bill from Cristina Martins, a Liberal MPP, would amend the province's Occupational Health and Safety Act to prohibit employers from mandating workers to wear unsafe footwear as part of dress and uniform codes. It's an issue that is a particular problem in restaurants and bars, Martins said. "We've had some women coming forward and saying that as a result of them not wearing the mandatory high heels that they've missed shifts, they've been asked to stay home and in some cases lost their jobs -- mostly in the food industry and the hospitality industry, that's where we see most of the complaints coming from," she said Tuesday. "Note that these dress codes are and always have been gendered and only women are expected to risk their personal safety to meet these unfair dress codes." The bill comes after British Columbia banned mandatory high heels in the workplace earlier this year. Ontario's current footwear protections under the Occupational Health and Safety Act deal more with industrial workplaces as well as health care facilities, with regulations to protect against specific hazards and foot injuries. The president of the Ontario Podiatric Medical Association said wearing high heels causes a higher incidence of bunions, musculoskeletal pain and injury than those who do not wear high heels. "Ontario podiatrists see far too many patients with injuries in the workplace that are entirely avoidable that are caused by wearing footwear that is inappropriate or outright unsafe," James Hill said in a statement. "Podiatrists treat foot pain and deformities in women twice as often as foot disabilities in men, often due to having to wear high heels in their workplaces." 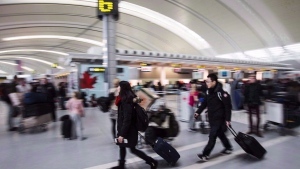 The Ontario Human Rights Commission issued a policy paper last year on gender-specific dress codes, saying women who work in restaurants and bars should not be forced to wear high heels, short skirts and low-cut tops.